From very modest beginnings Global has developed into one of the most successful brands of professional kitchen knives in the world. Still crafted by hand in Yoshikin's factory in Niigata, Japan, Global knives are manufactured to extremely high and exacting standards. 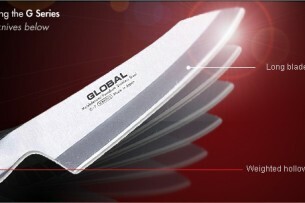 The G Series is a classic collection of large knives for general preparation and also for the more adventurous chef. This range includes the best selling knife – the G-2 20cm Cooks knife, as well as other ‘must-haves’ like the Bread knife and 16cm Boning knife. Finally the opportunity has arisen for Global to start work on a BRAND NEW model range. We proudly introduce to you Global Sai. This series is aimed at the true knife aficionado or professional chef. It can only be produced in relatively modest quantities and we are privileged in being one of only three countries in the world which will witness the introduction of these knives. 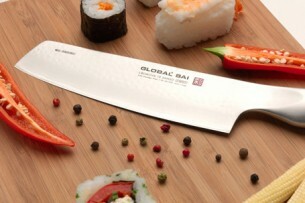 The Global Sai range has been developed by Komin Yamada who also designed the first Global knife. Komin tells us that,’ The Global knife became, and is still, a truly Global product and a design classic that has found its way into practically every food lovers home throughout the world’. But the world has changed since Komin Yamada first designed Global knives and the new Sai range has been designed to reflect that. The brief given to Komin Yamada was to design a new range of Global knives and his starting point was the world today, the contemporary zeitgeist.